The Antonov An-32 (NATO reporting name: Cline) is a twin-engined turboprop military transport aircraft. An-32 of AirMark at Singapore Changi Airport (2011). The An-32 is essentially a re-engined An-26. The launch customer was the Indian Air Force, which ordered the aircraft partly due to good relations between then USSR leader Leonid Brezhnev and then India leader Indira Gandhi. The An-32 is designed to withstand adverse weather conditions better than the standard An-26. 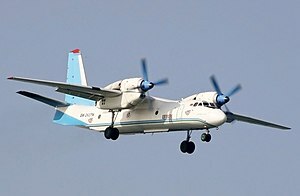 The high placement of the engine nacelles above the wing allowed for larger diameter propellers, which are driven by 5,100 hp rated Ivchenko AI-20 turboprop engines, providing almost twice the power of the An-26's AI-24 powerplants. Estimated price for a modernised An-32 version is 15 million US dollars. The An-32 has excellent takeoff characteristics in hot and high conditions, (up to + 55 °C (131 °F; 328 K) and 4,500 m (14,800 ft) elevation suitable for use as a medium tactical military transport roles as well as commercial roles. Operating as a cargo transport over the short and medium range air routes, the An-32 is suitable for air-dropping cargo, passenger carrying, medevac, firefighting, skydiving or paratrooping roles. An-32A : The first civil variant, the majority of the 36 aircraft built were delivered to various MAP and MOM enterprises, for use in transporting assemblies between plants. An-32B-100 : Modernised version of the An-32B. MTOW increased to 28.5 tons, payload increased to 7.5 tons. An-32B-110 : New avionics allowing aircraft to be operated by two crew members. Metric (Russian) avionics variant. An-32B-120 : Imperial (non-Russian) avionics variant of An-32B-110. An-32B-300 : Version fitted with Rolls-Royce AE 2100 turboprop engines, providing 4,600 hp each. An-32LL (Letayushchaya Laboratoriya flying laboratory): The very first prototype of An-32 (actually Antonov An-26 number 10-06) was equipped with a large eight-bladed propeller SV-36P of D-236 engine in place of the standard AV-68DM on the port engine. However, without much success - the noise significantly increased, up to 115-120 dB, the characteristics were not much improved. An-32MP : Marine Patrol version. An-32P Firekiller : Aerial firefighting version. Special category type certificate granted on 10 March 1995. A total of eight tons of liquid can be discharged from the two external tanks simultaneously or one after the other. Drops are conducted at 40–50 m above ground level and 240 to 260 km/h. Can be used as a cargo aircraft when not fighting fires. An-32V-200 : A tactical transport/cargo aircraft outgrowth from the An-32B-100, with more modern avionics allowing two crew operation. Intended for export; despite reasonable interest few have been sold. An-32 RE : Modernised version of the An-32B. MTOW increased to 28.5 tons, payload increased to 7.5 tons. New avionics. An-32 operators (countries with only airline operators are in green). Antonov An-32B of the Indian Air Force at Leh Airbase. Sri Lankan Air Force Antonov An-32B. Sun Air Charter An-32 at Lokichogio Airport. Antonov An-32B of the Croatian Air Force. Antonov An-32C of Bangladesh Air Force. Mexican Navy Antonov An-32B landing at Kyiv International Airport. More than 240 An-32 aircraft are being operated in the countries around the world. Bangladesh Air Force :three aircraft received and currently in service. 2 An-32B&1 An-32C. Indian Air Force: Bought 125 aircraft, 105 are still in service. Entire fleet is undergoing modernization; 35 upgraded An-32s have been delivered by Ukrspetsexport. The upgrades include modern avionics equipment, new oxygen systems and improved crew seats. The remaining aircraft are being upgraded in India. Iraqi Air Force: Six delivered as of October 2012. Mexican Air Force: One An-32. At least six were delivered to the Afghan Air Force from 1987. All remaining aircraft were retired in June 2011. Croatian Air Force: Operated 2 An-32B's, they were modernized in 2004. and subsequently retired and put up for sale in 2014. after being declared redundant. In July 2016, a total of 25 Antonov An-32 aircraft remain in airline service. The largest operator is Aero Transporte S.A (ATSA) of Peru with four aircraft. Some 16 other airlines operate smaller numbers of the type. On 25 March 1986, an Indian Air Force An-32 disappeared over the Arabian Sea on a delivery flight from the Soviet Union (via Muscat, Oman.) No trace was ever found of the aircraft or its three crew and four passengers. On 15 July 1990, an Indian Air Force An-32 transport plane crashed in the Ponmudi Mountain range while en route from Tambaram Air Force Station to Thiruvananthapuram in India. On 22 November 1995, a Sri Lankan Air Force An-32B which chartered from the Kazakh was shot down during a landing in Jaffna, and all 63 troops aboard killed. On 8 January 1996, an An-32 freighter crashed into a crowded marketplace in Kinshasa, Zaire, resulting in the deaths of approximately 237 people on the ground. The crew attempted to abort the takeoff at Kinshasa-N'Dolo Airport after the aircraft failed to gain height. All six crew members survived. Overloading was cited as a possible cause. On 28 March 1998, a Peruvian Air Force An-32 carrying the dual civil/military registration OB-1389/FAP-388 and inbound from Tumbes evacuating 50 people stranded by El Niño-driven floods had an engine failure while approaching Piura. As the aircraft was overloaded, the pilot could not maintain height and the AN-32 struck three houses of a nearby shantytown and crashed into a canal. While the crew of five survived, 21 passengers died plus one person on the ground. On 26 August 2007, a Great Lakes Business Company An-32B carrying nine tons of minerals, 12 passengers, and a crew of three experienced engine trouble after takeoff from Kongolo Airport, Kongolo, Democratic Republic of the Congo, and crashed short of the runway while attempting to return to the airport, killing 14 of the 15 people on board. On 10 June 2009, an Indian Air Force, An-32 transport aircraft carrying 13 people crashed shortly after it took off from Mechukha in Arunachal Pradesh, a state bordering China. All 13 people on board were reported to have been killed. Soon after the crash, India agreed a $US400 million deal with Ukraine for an An-32 fleet upgrade. This upgrade as reported will extend the life of these transport aircraft by nearly 15 years. On 12 December 2014, a Sri Lankan Air Force, An-32 transport aircraft carrying five people crashed on approach to land at the Rathmalana Airport after taking off from Katunayaka Bandaranayake International Airport. The pilot, co-pilot and two of the aircrew were killed in the crash and the fifth crew member suffered critical injuries and died after six days from the accident due to his injuries. On 3 October 2018 a Sudan Air Force AN 32 collided with another Sudan Air Force Antonov An-30 at Khartoum airport. ^ "реестр самолётов типа Антонов Ан-32". russianplanes.net (in Russian). Retrieved February 9, 2019. ^ a b Antonov An-32. "Ан нет, Ан есть. Украина «нашла» потерянные индийские Ан-32." http://warfiles.ru/,[permanent dead link] 20 April 2015. ^ "✈ russianplanes.net ✈ наша авиация". russianplanes.net. Archived from the original on 2015-09-10. ^ a b "An-32. "Archived September 6, 2005, at the Wayback Machine Antonov.com. Retrieved: 12 November 2011. ^ a b "Kiev Aviation Plant: 'Aviant' Аn-32B–110/120." Archived 2008-08-08 at the Wayback Machine aviant.ua. Retrieved: 12 November 2011. ^ "Kiev Aviation Plant: 'Aviant' – An-32B-300." Archived 2009-02-20 at the Wayback Machine aviant.ua. Retrieved: 12 November 2011. ^ "AKL-201603 AviaKollektsia 3 2016: Antonov An-32 Cline Twin-Engined Turboprop Military Transport Aircraft". modelgrad.com. Retrieved 2017-10-21. ^ a b "An-32P. "Archived April 30, 2008, at the Wayback Machine Antonov.com. Retrieved: 12 November 2011. ^ a b Hoyle Flight International 11–17 December 2012, p. 49. ^ "IAF awaits 'safe' return of last batch of AN-32 fleet". Deccan Herald. Retrieved 26 December 2014. ^ a b Hoyle Flight International 11–17 December 2012, p. 55. ^ a b c Hoyle Flight International 11–17 December 2012, p. 57. ^ a b Hoyle Flight International 11–17 December 2012, p. 60. ^ Thisdell and Farfard Flight International 9–15 August 2016, pp. 28–29. ^ Harro Ranter (26 August 2007). "ASN Aircraft accident Antonov 32B 9Q-CAC Kongolo Airport (KOO)". aviation-safety.net. Retrieved 3 July 2015. ^ "India inks AN-32 upgrade deal with Ukraine." Times of India. Retrieved: 29 June 2011. ^ Harro Ranter (12 December 2014). "ASN Aircraft accident Antonov 32B SCM-864 Hokandara". aviation-safety.net. ^ "Plane crash in Athurugiriya". Daily Mirror. 12 December 2014. Retrieved 12 December 2014. ^ "Fears Grow As Indian Air Force AN-32 Remains Untraceable". ^ "BREAKING Two Antonov aircraft have collided on the ground at Khartoum Airport, Sudan". Airlive Contributors. Retrieved 2018-10-03. Hoyle, Craig. "World Air Forces Directory". Flight International, Vol. 188 No. 5517. 8–14 December 2015. pp. 26–53. ISSN 0015-3710. Wikimedia Commons has media related to Antonov An-32.